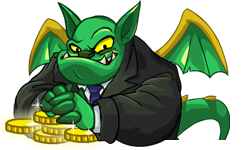 It's payday, and at the National Neopian Bank, that means it's time to prepare for a rush of customers! Unfortunately, not everyone visiting the bank today plans on making a deposit: some, like Uzarro and the Meerca Brothers have a withdrawal in mind... and they don't even have bank accounts! In Trouble at the National Neopian you play as a lone bank teller, taking in Neopoint deposits from regular customers and preventing criminals from entering the lobby at an ever-increasing rate. To do this you have six buttons that you activate with the S, D, F, J, K, and L keys on your keyboard, each of which will bar off the door above it. Be careful to only use these buttons when a known bank robber appears, however; if you try to bring the bars down on a closed door you'll lose 10 NP, and if you bar a customer, you'll lose a life. You will also lose a life whenever a criminal gets away with your Neopoints, and if you lose all three of your lives, it's game over. And they thought I was crazy, installing bars in all the doorways! If you fail to stop a criminal in time, not only will you lose a life, they'll make off with half of your on-hand Neopoints. To prevent this, any time that you have at least 100 NP, you can press the Space bar to convert them into a gold bar, which is too heavy for the criminals to carry. Don't try to do this when you have less than 100 NP, however, as you will be fined 10 NP. Every time you reach a certain milestone in the number of Neopoints you've collected, you'll advance one level. These are in multiples of thirty, with Level 2 coming at 30 NP, Level 3 at 60 NP, and so on. Rather than advancing a level for every 30 NP collected, they only occur at predetermined points; if you have 40 NP and half are stolen, you will have to reach 60 NP to go on to Level 3, instead of just reaching 30 NP again. As you advance to higher levels, visitors will begin to appear more quickly, and new customers and criminals will be introduced. On very rare occasions, you will get a visit from The Phantom Orange Shirt Guy, who will deposit 25 NP. All those cameos pay quite well! 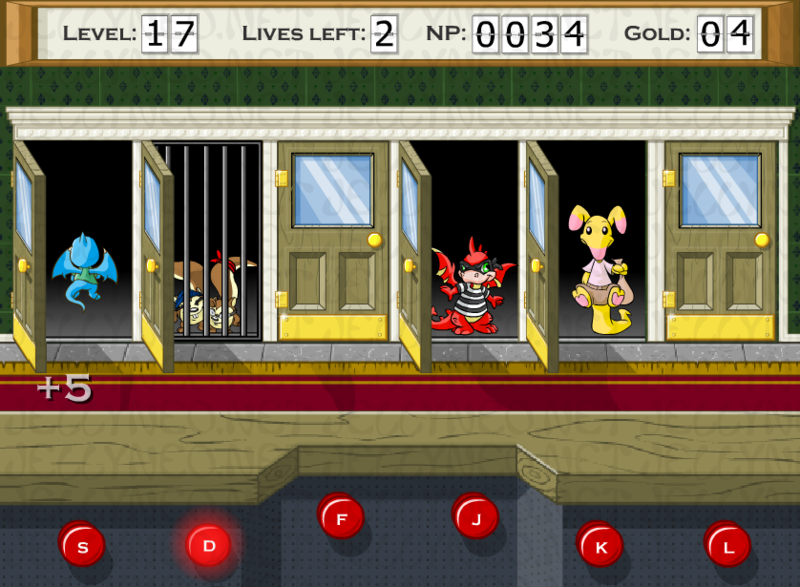 Your score is equivalent to the number of Neopoints you have when the game ends, with each gold bar counting as 100 NP. Trophy scores are typically above 3000 points, so if that's your goal, you will want to collect at least thirty gold bars. Press the Space bar to convert 100 NP into unstealable gold bars. None of the customers are red, and none of the criminals are blue or yellow; use this to spot criminals more quickly in the later levels. Press X to turn off the sound. This doesn't make much of a difference during gameplay, but at least you won't have to listen to banjo music between games. I don't suppose you'd be willing to work the Friday before Christmas...?